Erich Fromm was the only child of Orthodox parents. After the Nazi took over power in Germany, Erich moved to New York. He was a German social psychologist, psychoanalyst sociologist , Democratic socialist , and humanistic philosopher . 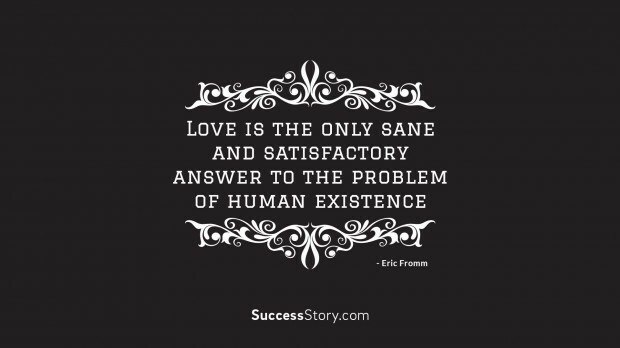 "Love is the only sane and satisfactory answer to the problem of human existence "
Erich’s writings were notable for their social and political commentary and for their philosophical and psychological underpinnings. He believed that freedom was an aspect of human nature . He observed that embracing our freedom at will was healthy, whereas escaping freedom through the use of escape mechanisms was the root cause of psychological conflicts. He outlined three of the most common escape mechanisms automaton conformity, authoritarianism, and destructiveness. Erich's best known Quotes focus on the human urge to seek a source of authority and control upon reaching a freedom that is thought to be an individual’s true desire. Erich based his writings primarily from the early works of Karl Marx . He sought to re-emphasize the ideal of freedom, missing from most Soviet Marxism , frequently found in the writings of Libertarian socialists and liberal theoreticians. His thoughts are very clear that Man’s main task is to give birth to himself , and to become what he potentially is . The most important product of all his efforts is his own personality. His psychologist quotes describe love as immature and mature and he differentiates that Immature Love says , I love you because I need you , whereas Mature Love says I need you because I love you. His is a splendid and simple way to describe Love in Quotes.